Digger Highlander was an everyday, average Chorkie, a cute little dog who loved his family and had a particular fondness for playing in the yard. But one day, when he was at home with his human sister, Kilee, Digger smelled a funny odor and then heard a loud boom! Confused at first, he quickly realized Kilee was in trouble. There had been a gas leak in the house, and the candle Kilee lit had started a fire. Kilee lay on the bathroom floor, unconscious and covered in burns. That’s when Digger sprang into action. He raced to the bathroom and barked so loudly that he roused Kilee before leading her running from the house, leaving behind the deadly flames. 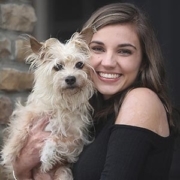 Kilee spent thirty-eight days recovering in a hospital, and when she returned home, Digger stayed by her side as she faced a difficult recovery. Today, more than three years after the fire, Digger remains Kilee’s best friend and protector—a genuine hero who just happens to wear fur. Digger the Hero Dog is a true story of the bond between humans and their pets with a happy ending and an important fire-safety message for children. Just as Digger did, kids will learn that even the littlest among them can make a huge difference in the life of a friend. 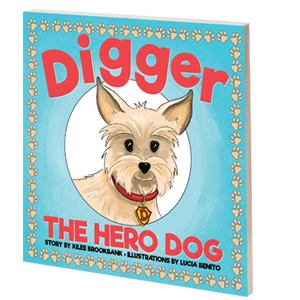 Author Kilee Brookbank shares how her best friend, Digger, became her hero by saving her life. Kilee Brookbank is a college student, shoe fanatic, animal lover—and burn survivor. Severely injured when a gas leak caused her house to explode in November 2014, Kilee was hospitalized for thirty-eight days before returning home to a life of new challenges and a new “normal.” Kilee, who attends Xavier University, wrote the award-winning Beautiful Scars in 2016 and is the founder of the Kilee Gives Back Foundation. Her inspiring story has been featured by The Doctors, Inside Edition, MTV, Seventeen, Girls’ Life, Woman’s World, and Redbook. Please call 937-483-4204 for special pricing and shipping information for bulk orders. Digger the Hero Dog is distributed by Baker & Taylor Publisher Services.